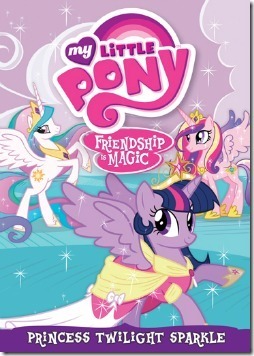 This final DVD in the My Little Pony Friendship is Magic series features five episodes centered around Twilight Sparkle including the coronation of Princess Twilight Sparkle! I watched the last episode of MLP: Friendship is Magic not too long ago (before I got the DVD) and I was crying! Yes me a grown woman. It was a beautiful episode and THE BEST one of the whole series. Its amazing how much a cartoon can move you. The episode was grand, the music was grand, the whole thing was grand. My daughters, son and I could watch that episode OVER AND OVER again. This is from the beginning of the last episode, my favourite! Shout Factory Kids is allowing me to giveaway a copy of My Little Pony Friendship is Magic: Princess Twilight Sparkle on DVD. Other Winners contact info will be shared with a PR agency for the purpose of mailing your prize. See full terms & conditions on rafflecopter form.